The first program I ever wrote was a little bot called Flatterybot1. She’s a sweet little thing who’ll give compliments to anyone who asks. Flatterybot is very simple. Held tightly to her heart is a YAML file of compliments. 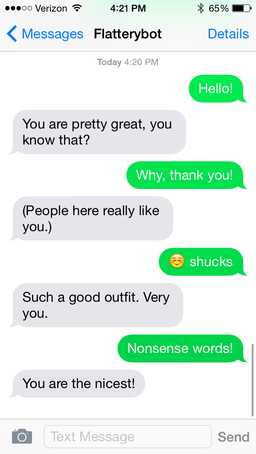 When a compliment is requested, she chooses one at random and sends it out. This simple but delightful output makes her easy and desirable to implement when I’m learning a new computer thing. For example, here she is as a no-frills Sinatra web app. You can text Flatterybot at 1 (305) 964-8649. Standard messaging rates apply, etc., etc., etc.